The Organic Mechanic is a true one stop auto shop in Asheville, NC. Our team of dedicated employees have a common goal, complete customer satisfaction in all aspects of their visit. Since 2004 we have been serving the greater Asheville area, providing complete import and domestic auto repair for all makes and models of vehicles. We have developed ways in our shop that allow us to reduce our carbon footprint while still giving our customers the best repair and maintenance service possible. We take great pride in our ability to quickly diagnose problems, allowing us to minimize your vehicle's downtime, getting you back on the road fast. The Organic Mechanic was founded by Charley Wilson. As the owner and an ASE certified technician who has been working on vehicle's since he was very young he is confident in his abilities to identify and repair any issue with your vehicle. Following his graduation from Warren Wilson College with a degree in biology he started his shop in 2004 with little more than a bag of tools. Charley is widely supported by his wife Kate who has spent many nights in the shop, seeing as they called it home for a short amount of time. In December 2010 the Wilson's welcomed a new employee to the shop, a beautiful little boy named Dutch Edward. Dutch has since taken the role of The Organic Mechanic spokesmodel. Alas, Josie the Shop Mop cannot be left out. She takes auto repair serious, but fancies sticks just a bit more! As a shop that is strongly dedicated to providing the highest quality repairs possible we find it very important for our customers sake, and our own, to have a well suited service manager. Shane Sharkey is not only a factory trained technician from Toyota, but he also has the necessary people skills to help our customers make informed decisions about their auto repair. 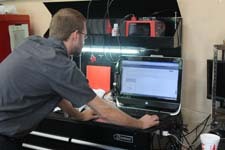 Shane is happy to answer any questions about the services we provide and talk with you about necessary auto maintenance. At The Organic Mechanic we are 100 percent committed to providing our customers with reliable and honest auto repair and maintenance. When we conduct any service we always use the highest quality replacement parts and fluids for your particular vehicle. Our work doesn't stop until your car is completely repaired and ready for the road. As a family ran business we understand how important it is to have transportation you can rely on, so allow us to take care of your import or domestic car, truck or SUV and we will be happy to offer you a 12 month/12,000 mile nationwide limited warranty that covers both parts and labor! Head to The Organic Mechanic the next time you need service and find out why we've been voted a top auto repair shop in Asheville and throughout Western North Carolina by readers of the Mountain Xpress for the last decade. Call us today at (828) 232-8120 to request an appointment for top-tier auto repair in Asheville! "I am always satisfied with the quality of the work done, and especially by the integrity of the complete staff."